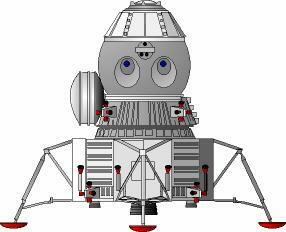 Lunar lander of the Lunar Expeditionary Complex (LEK). Russian manned lunar lander. Study 1973. Lunar lander for the Vulkan surface base. As in the original LK lunar lander, this would be taken to near zero velocity near the lunar surface by the Vulkan Block V 'lunar crasher' rocket stage. AKA: Lunniy ekspeditionniy korabl'. Status: Study 1973. Gross mass: 31,000 kg (68,000 lb). Height: 9.70 m (31.80 ft). Span: 11.30 m (37.00 ft). It would then descend to the lunar surface using a landing stage nearly identical to the American lunar module descent stage. This landing stage however would primarily provide propulsion of the upper Ascent/earth recovery stage to a trans-earth trajectory. The Ascent/earth recovery stage consisted of a re-entry capsule in the shape of but larger than the Soyuz descent module, encapsulated in a larger pressurized volume providing crew quarters and equipment storage. Crew Size: 3. Orbital Storage: 365 days. Family: Lunar Landers, Moon. Country: Russia. Spacecraft: LEK SA, LEK PS, LEK VS, LEK Lunar Expeditionary Complex. Launch Vehicles: Energia, Vulkan. Agency: Korolev bureau. Bibliography: 367, 89. 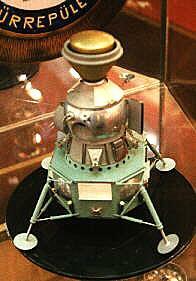 Model of LEK in Energia museum - unusual re-entry capsule or subsidiary module at its top. Assorted Soviet Lunar vehicles - clockwise from upper left: LK manned lander. Lunokhod manned traverse crawler. E-6 photographic soft lander. E-8 landing site scout (with solar panels to power homing beacon, soil qualities probe, soil return capsule). Alternate Lunokhod manned rover design. 1977 December 1 - . Launch Vehicle: N1. Glushko uninterested in further lunar base work - . Nation: Russia. Related Persons: Bushuyev. Spacecraft: Buran, LEK, Lunokhod LEK, LZhM, LZM. 1978 January 1 - . Vulkan Lunar Base rejected - . Nation: Russia. Related Persons: Glushko, Keldysh. 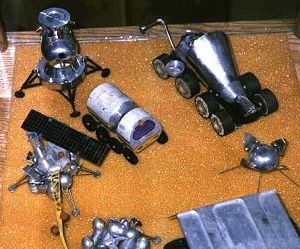 Spacecraft: LEK, Lunokhod LEK, LZhM, LZM.